Inexplicata-The Journal of Hispanic Ufology: Argentina: A Friday the 13th UFO in Villa Ventana? 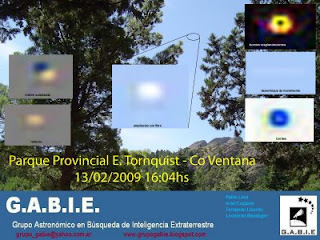 Argentina: A Friday the 13th UFO in Villa Ventana? "This being the last day of our research in the Villa Ventana area, we are publishing the last photo taken today, Friday, at the Tornquist Provincial Park at 16:04 hours. It should be noted that the reason for having taken this photo stemmed from the "need" of a team member to point his camera skyward at precisely that moment. The analysis shows that a spherical object was in motion at the time that the photo was taken. It had a uniform relief throughout its contour, and it became more noticeable when the solarized filter was applied to it."